Discussion in 'Touring Northern Thailand - Trip Reports Forum' started by DavidFL, Jun 23, 2009. An incredible place & well worth a visit. The artist devoted himself to an examination of his Thai identity. He then began to explore and reexamine the insanity, degeneration, violence, eroticism, and death lurking in the heart of modern man as they are involved with religion. Mr. Thawan expressed these concepts with a startling technique utilizing a black tone, drawing from the wellspring of traditional Thai Buddhist art and Buddhist thought. With his capacity and performance that have shocked the world, Mr. Thawan Duchanee is a deserving choice as the laureate of the Arts and Culture Prize of the Fukuoka Asian Culture Prizes. Where is it - map coming. To quote you on this one David, "You beauty!" What a great place & well worth a visit. WOW,, what a place,, looks like there is lot of history collection on those bones..
Marco wrote: WOW,, what a place,, looks like there is lot of history collection on those bones..
No idea really. Whilst the grounds were open, it was a Sunday & all the buildings were locked up. The place was pretty well deserted. It was a kind of a weird & eerie feeling being there; but the place is beautiful. Location: the place is North of Chiang Rai, 1.9 kms past the CR University, turn left into Soi 13, go 470 metres & turn left into a small soi, proceed 360 metres & it is on the left on a right hand corner. Amazing indeed. This is what the artist himself has to say about the UFO: "This is my telephone booth where I talk directly to God. It’s a ‘box’ containing my body and spirit.” His favourite house for painting is a black, submarine-shaped house with round windows. Everything in the house is black. aschoch wrote: Amazing indeed. This is what the artist himself has to say about the UFO: "This is my telephone booth where I talk directly to God. It&#8217;s a &#8216;box&#8217; containing my body and spirit.&#8221; His favourite house for painting is a black, submarine-shaped house with round windows. Everything in the house is black. Thanks for the link. Now I'm "enlightened" about Ajarn Thawan Duchanee. Indeed an amazing guy & place he has got there. Something for the more intellectual & arty-farty GT Riders to check out & photograph. Not been there yet, however it appears that this is another contemporary unconventional Buddhist temple in the Chiang Rai area. Does anyone -"arty-farty GT Riders" or not(':wink:')- know another example in the North or anywhere else in Thailand, before we could say this is a northern trend? With a totally different style the other one has already been mentioned on this board by Ally: Wat Rong Khun famous amongst Thais (located south of Chiang Rai, near the intersection highway 1/road 1208). People are always saying Black Village is located on soi 13, but it is really Moo 13 soi 1. The only sign there is in Thai so I guess it is easy to get it mixed up. The map does give you a pretty good idea, however. Perhaps someone should take a picture of the wooden sign at the mouth of the soi. Not easy to find but well worth the effort. 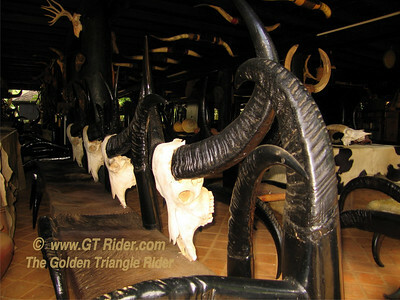 Davidfl wrote: [quote quote=Marco]WOW,, what a place,, looks like there is lot of history collection on those bones..
For Richard & Kuhu (Mobile Atlas screenshots) whom we met at Miguel's last night. A brief update Acharn Duchanee has passed away. Thawan Duchanee , a national artist, dies of hepatitis yesterday. He was 74. His son, Doytibet, announced the death of his father on his Facebook page but did not disclose the cause of his father’s death. However the son praised him for leaving behind the immortal work. Several online media said Thawan died of hepatitis after receiving treatment at a hospital for three months. 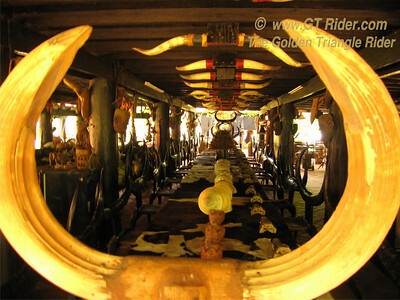 There will be praying ceremonies at Wat Dhepsirin temple for seven days. Thawan was appointed a national artist on visual arts in 2001. Born in 1939 in Chiang Rai province, Thawan studied at the Poh Chang Arts and Crafts College and Silpakorn University. His paintings are widely praised, both in Thailand and abroad. But it was in his home country where he found the widest appreciation. Art collectors and experts alike constantly seek his works. 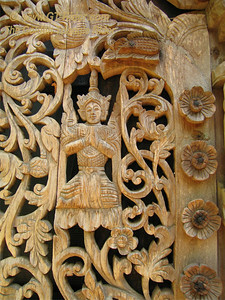 Thawan is survived by four sons. The death yesterday morning of Thawan Duchanee, one of Thailand's most esteemed artists - and one of its best known overseas - set off ever-widening ripples of grief through the art world, along with fond recollections of a man as extraordinary in his creativity as he was in his appearance and speech. Thawan, who called Chiang Rai home, was instantly recognisable for his bushy white beard and northern-style clothes - invariably black and adorned with animal bones and claws. His voice was loud and commanding, often given to satirical, absurdist humour. He died of kidney failure following three months of treatment. He would have turned 75 on September 27. Named a National Artist in 2001, the same year he won the Fukuoka Asian Culture prize, Thawan was renowned for the painstaking weeks-long efforts that went into his drawings and paintings, all elaborate lines and delicate patterns. In contrast, he could, with a flourish of brushwork, capture in seconds the swift motions of horses and eagles, tigers and lions. "Although I paint neither the starvation nor the poverty of man, my painting is powerful," Thawan told The Nation in 2004 when his exhibition "Trinity" was at the Queen's Gallery in Bangkok. "Many collectors say, when they see my bold brushstrokes, that they feel the power and the spiritual satisfaction. I believe a good artist should direct people to look at the sparkling light of the Milky Way rather than their waiting graves." The astounding "Trinity" show drew the sort of spectators who rarely frequent art galleries. It was his first retrospective in Thailand - and turned out to be his last. Thawan earned his doctorate at Amsterdam's Rijks Academic Van Beeletende Kunster in 1968 and took a long time sharing his work with compatriots. And yet "Trinity" was not a retrospective, he insisted. "If it were, the organisers would have had to travel around the world to borrow my work from all the museums, and the insurance alone would cost more than Bt1 billion." 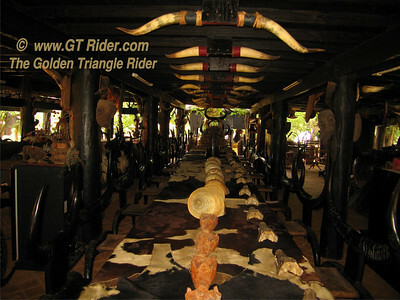 As it was, the exhibition required five 10-wheel trucks to deliver 300 pieces from his sprawling home in Chiang Rai. Ten technicians toiled for four days to mount them on all three floors, and this was just work from the previous couple of years. There were his sketches on white paper and red canvas - 20-second assaults in oil or black ink that uncannily caught the lunge of a jungle beast. "It shouldn't take any longer or any less time," Thawan said. "I once painted an eagle in flight in six seconds, but it wasn't completely perfect. I got the power of its wings, but not the beak and claws." These weren't whimsical impressions, either. "I went to a desert in Arizona to observe a snake that's capable of hopping short distances," he said. "I spent three months in the Philippines observing the behaviour of the eagle that eats monkey brains. Its movement is so fast that the monkey isn't even aware of its existence." The animals of the real world took on supernatural form in his art. "If you're going to use the animal's anatomy symbolically, you need a room of anatomy in your mind," Thawan said. "For example, you should first be good at the form of a snake before trying to paint the naga. Otherwise your naga might look like pipe snake, or your lion might look like a dog." As to the symbolism, however, Thawan bristled if anyone asked about meaning. "We never ask a star for whom it flickers, or ask a bird for whom it sings. I want people to feel something, not try to interpret its meaning. Feeling is what distinguishes humans from other animals." Collectors both local and foreign have always been ready to pay generous prices for Thawan's art, among them prominent businessmen like Boonchai Bencharongkul and the Sophonpanich family. Boonchai has more than 100 of his paintings on view at his Museum of Contemporary Art on Vibhavadi-Rangsit Road. "Thawan inspired me to become a patron of the arts 20 years ago, when he said I could be 'a drop of water for parched soil'," Boonchai recalled in 2012. "He's a great representative of the artists from the East." Thawan's personal empire in Chiang Rai is called Baan Dam - the Black House - an acute though coincidental contrast to nearby Wat Rong Khun, the ornate white temple his artist-friend Chalermchai Kosipitpat is building. 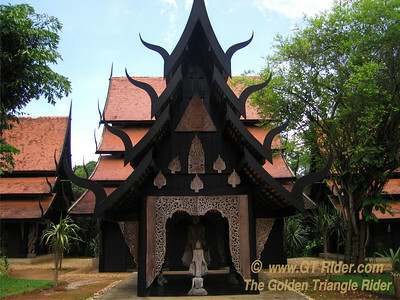 Baan Dam has more than 30 structures scattered across hundreds of rai, varying in size and style. Some are associated with "the diabolical", perhaps thanks to their inky tones, but they do house his collection of animal skins, bones, horns and claws and the chairs and beds he fashioned from the bits of creatures. Some of the structures reflect the Lanna style while others resemble temple stupas. About 10 years ago I cheekily asked Thawan how much he was worth. It wasn't the sort of question he was ever going to answer directly. "I've never counted, but I don't know what poverty is!" he said. "Ever since I was 33 I've had enough money to live for 100 years. So I can devote the rest of my life to painting without worrying about expenses. But I'm like a candle that's lit at both ends. I might produce more light, but I burn out quicker. "I've already prepared for death," he continued. "When I was 37 I built my own coffin, delicately crafted in wood, and I'm now planning my funeral. I've erected the buildings and a chapel to house my work and my collections. I might die - but my art has to remain." Religious rites continue at Wat Thepsirinthawas through next Wednesday. The royally sponsored cremation takes place there next Thursday at 5pm. The Museum of Contemporary Art has four rooms of Thawan's work. It's on Vibhavadi-Rangsit Road, next to the Benchachinda Building, and open daily except Monday from 10 to 6. Call (02) 953 1005-7 or visit www.MoCABangkok.com. Duchanee's work is featured in the "Thai Charisma" exhibition at the Bangkok Art and Culture Centre until November 16, open 9.30am to 9pm daily except Monday. Call (02) 214 6630-8 or visit www.BACC.or.th. 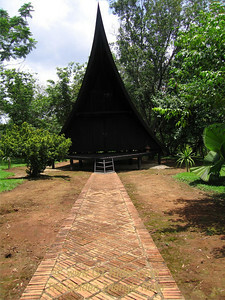 Baan Dam is in Chiang Rai's Nang Lae district and open daily from 9 to 5. Call (053) 776 333 or visit The Pha Daeng Mansion.